If you’ve ever dreamt of spending a week, month, or even longer travelling by campervan then you’re in luck. There are an increasing number of Portuguese and international companies that have campervans for hire in Portugal. Travelling by campervan is a fun way to explore Portugal, and it’s a great way to thoroughly explore the country. Portugal is very campervan-friendly and, as well as campsites, many people wildcamp in carparks and open spaces around the country. While this is technically illegal, the authorities generally tolerate it for most of the year as long as there’s no risk of fire. Travelling by campervan can also be an affordable way to travel, although it’s definitely not the cheapest way to see Portugal on a budget. Most companies charge between €50-80 per night for campervan hire, which is much more than it would normally cost to rent an Airbnb or cheap hostel and travel by public transport. Unless you’re travelling as part of a group, there are cheaper ways to get around Portugal. Motorhome or campervan travel is more about the experience more than anything else. It’s about waking up in a new place every morning, getting away from hotels and apartment rentals, and getting to see parts of the world that you might not otherwise. If that sounds like your perfect trip, here are some companies that offer campervan hire in Portugal. Motorhome Republic is a large international motorhome comparison website that allows you to book motorhome rentals in the United States, Australia, Canada, New Zealand, and, of course, Portugal. Motorhome Republic compares prices from several rental companies including Black Sheep, Pure Motorhomes, McRent, Euromotorhome, and Big Sky, allowing you to quickly see which company is the best value for money. West Coast Campers offer campervan hire in Spain and Portugal from a fleet that includes Fiat Ducatos, Renault Trafics, and Mercedes-Benz Sprinters. Accessories include a gas cooker, cooler, functional kitchen with sink, and kitchen utensils. Locations: Lisbon, Porto, Faro, and Seville and Malaga in Spain. Along with apartments, houses, yurts, and just about every other form of accommodation that you can think of, you can also rent motorhomes and campervans through Airbnb. There are no hundreds of campervans in Portugal listed on Airbnb, which makes this one of the easiest sites to rent through. See a full list of campervans on Airbnb here and, if you’ve never used Airbnb before, you can get €€€ off your first trip here. Wild Side Campers are a small campervan company that are located in Peniche, so perfect for surfers who are heading that direction. Their winter rates can be as cheap as €33 per day, which is ideal for those on a budget, and they also rent out scooters, surfing equipment, and bikes. Auto Euro is a car rental comparison site that also allows you to compare the cost of motorhome and campervan rental from a select number of companies in Portugal. The results normally include a mixture of campervans and motorhomes, suitable for 2-6 persons. Yescape is essentially Airbnb for campervans, and it allows you to rent campervans and motorhomes directly from the owners. Prices in Portugal start from around €30 per night, and you can rent everything from converted vans, family-size motorhomes, campervans, and traditional VW vans. Based in Porto, The Getaway Van offers a fleet of Ford Transit vans, with space for four people, for rent. All the vans come with essentials like a shower, a kitchen, blackout blinds, bed linen, and cooking utensils. Camptoo is another Airbnb for campervans and motorhomes and, like Yescapa, you can rent all sorts of vehicles from small campervans to large motorhomes. As well as Portugal, Camptoo is also available in other European countries like Germany, Spain, the Netherlands, and Italy. Campervan King Portugal offers campervans for hire in mainland Portugal, and the campervans can be collected from Lisbon, Faro, and Porto. Hostels on Wheels provide campervan rental in Portugal and Spain. Campervans, which are mainly Fiat Ducatos, are suitable for 4-5 persons and include integrated GPS, electricity, kitchen, and a security safe. Extra facilities and add-ons include a wifi router, table and chairs, surfboard, wetsuit, bluetooth speaker, foldable bike, and board games. Locations: Lisbon, Porto, Faro, and Madrid, Granada, Málaga, Seville, La Coruña, Santiago de Compostela, and Vigo in Spain. Happy Campers Portugal are based just outside of Lisbon, near Sintra. The company offers modern VW campervans that are suitable for 2-4 people with essentials like a refrigerator, stove, utensils, and sink. Campers van be picked up or dropped off in either Lisbon or Estoril. Portugal By Van offers modern vans that have been converted into campervans for hire. The company is based just outside of Lisbon, but the vans can be delivered to Lisbon Airport for an additional fee. Available extras include a solar shower, BBQ, child car seat, surfboards, and bodyboards. Fly N’ Surf is a campervan and surfboard rental company that offers campervans for hire in Lisbon, Porto, and Faro. The campervans are mainly vans that have been converted into campervans, and include a large bed and storage area. Winter rates start from around €36 per day during the low season (Mid November – Mid March), which is perfect for those trying to get the campervan experience on a budget. Algarve Campers is a Dutch-owned company that offers motorhomes for hire near Faro. Motorhome facilities include a shower, toilet, crockery and cutlery, refrigerator, stove, and aircon. Indie Campers offer campervans for hire in several different countries, including Italy, Belgium, Germany, The Netherlands, the UK, and Portugal. The vans available are typically large and modern, and guests can also book extras like wetsuits, paddleboards, surfboards, portable heaters, and snowchains. 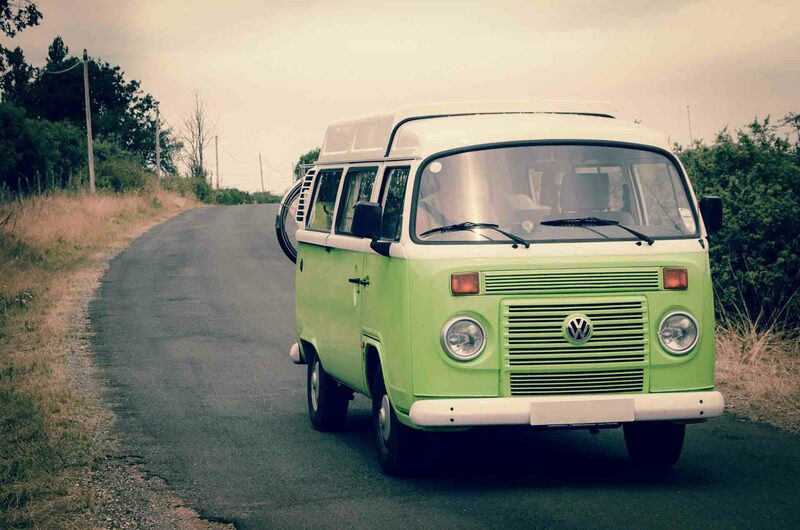 Siesta Campers offer classic and modern VW campervans for rent in Lisbon, Faro, and Porto. The campervans sleep between 2 and 5 people, and are ideal for couples or young families. Note: The classic campers are restricted to the Algarve so, if you’re planning to travel to other parts of Portugal, you should rent one of the modern models. Vanscape is a Portuguese motorhome rental company based at Lisboa Camping, a campsite on the outskirts of Lisbon. The company offers stylish motorhomes for hire, and each motorhome is equipped with a fridge, solar panel, cooker, cooking utensils, and a water heater. Guests can also add extra to their booking like a GPS system, wifi router, surfboard, bicycle, or tent. Black Sheep Campervans is a French campervan hire company that offers campervan rentals throughout Western Europe including Portugal. The campervans are available for collection from either Lisbon or Porto, and include essentials like a shower system, picnic table and chairs, stove, and USB ports. I’ve used Siesta Campers a couple of times now. Both times with a VW California. Great friendly team 5 minutes from Lisbon Airport. Would definitely recommend. Thanks Tom, great to have a review from someone who’s used them. Will have to give them a try. Thanks for the suggestion. Added. I have rented a van two times in Portugal. The first time I searched a lot on the internet to find good prices and ended up booking with Camper King Portugal https://camperkingportugal.com/ . I had a good experience overall, good value for money. The second time I rented on Airbnb (Yes, you can also rent RVs there). I checked the reviews of the host, he was a super host. Everything went great. I can recommend both. Thanks for the recommendation. Have added them both. Used Yescapa. Got a vehicle with battery problems that left us without power steering or brakes on the highway, forcing an emergency stop. Informed the owner and we were able to fix it and keep going. Failed again multiple times, causing delays. As we got to the destination, when opening a window normaly, it disassembled on our hands. Were able to put it back. As we returned we were not returned our deposit because allegedly we had broken the window and still asked more money to fix it. Terrible experience! Sorry to hear you had such an awful experience, but thanks for leaving a review – it helps others avoid a similar experience. Had a terrible experience ourselves with Yescapa. The host was delayed by 3 hours, wasting our precious holiday time. The van was dirty and they even wiped the toilet down and then wiped the table to eat from down with the same cloth, disgusting. The van overheated on the way to Algarve and sat and waited for 2 hours for a truck and there was no replacement vehicle. Wasted holiday indeed. Thank you for adding your review of Yescapa.